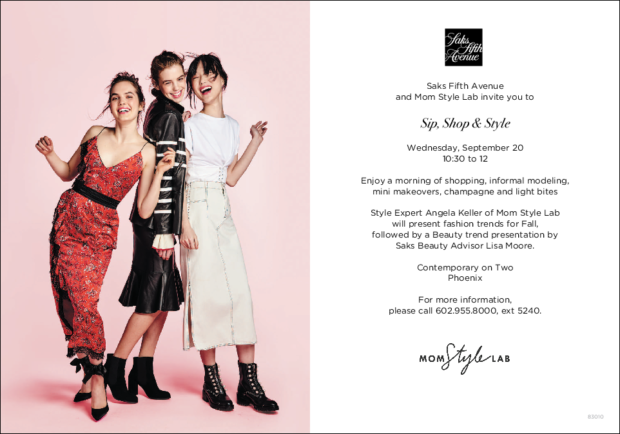 We are thrilled to announce that MSL is teaming up with Saks Fifth Avenue once again this fall to host “Sip, Shop & Style” on September 20th in Phoenix! Last year’s event was a blast and everyone that came walked away with the latest intel on fall fashion and beauty trends. We promise to deliver the same this year, as Angela will be highlighting the biggest trends in fashion and accessories for the season, plus Chanel Beauty Ambassador & makeup artist Lisa Moore will be talking about and showing us what we need to know to uplevel our beauty game. These two ladies will help you navigate fall’s best trends following the presentation, while you shop the new collections and enjoy champagne with us. Bring your besties!! RSVP is not required, but appreciated. As part of Saks Fifth Avenue’s fall contemporary fashion unveiling, guests will have an opportunity to earn up to $700 back in the form of a gift card. The more you spend, the more you get back to shop with later. Luxe furs and embellished denim. All above photos courtesy of Saks Fifth Avenue. See highlights from last year’s Sip, Shop & Style.